which was written by the artist's sister. but Keith Haring never stopped drawing! He even invited friends over to draw together. and spent his teen years in his room with music blaring while he drew on every piece of paper he could find. After winning an art contest in high school, Haring gave the drawing away when asked how much he would charge for it. In art school, Haring was inspired by new and popular ideas. The art school wasn't so pleased so he quit. Thus began his move away from traditional art and the ways of traditional artists. Haring moved to NYC where the city became his canvas. He first intrigued commuters in the subways where his distinctive chalk drawings would fill black chalkboards which usually held ads. Later he often drew on the streets, sometimes cleaning up an area before painting his joyful figures. He accepted that his art would get washed away and he would get in trouble for graffiti. But "he just kept drawing." His art became so recognizable and popular that an art gallery gave him the first of many exhibitions. All his art sold. When interviewed, he said that he didn't really need the money and would be donating most of it to food organizations for hungry children. Haring's work often celebrated children and families. Below you'll see how he invited 1000 children to help him create his 6 story long rendition of The Statue of Liberty on her 100th anniversary. When he was asked to exhibit in international museums and galleries, he insisted there be a place where he could paint a mural for all to enjoy, not just those who could afford museums and art purchases. Haring's sister relates the passion of her brother's vocation by saying "he would draw on anything, anytime, anywhere." 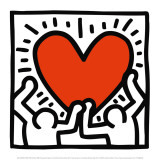 Hanna’s Comments: The older children and teens in your faith family will relate to Keith Haring. His art is so accessible and yet he was a rebel of the art world. I believe it is important to give children & teens stories of those who tap into their gifts and explore their vocations as young people. It behooves us to help our children explore how their gifts, interests, and inclinations might bless the world. Haring is a wonderful example of knowing who you are meant to be and sharing your gifts for a better world. He seems to have been such a good human being who related to the world in ways that mostly celebrated being human. Haring died of AIDS in 1990. His death is not mentioned in this book except in the back where you'll find a lot more info. about his childhood, details about the art in this book, and some fun photos. There are a lot of interesting images and stories about Haring on the internet that you can use to bolster any program you want to do on him in your faith family. I was already a fan but there's a 30 minute video on Youtube that made me like him all the more. Here's a story about Haring's Statue of Liberty banner 20 years later. Idea(s) for Application: Read this book to a group of teens who are beginning to explore how God's gifts of their talents, interests, and inclinations can be a blessings to the world.